Meanwhile, a new tropical storm, named Katia, formed on Monday. This one got started near Africa, and those hurricanes tend to be killers, because they have the whole Atlantic Ocean to cross and give them strength before they reach the Caribbean or North America. It looks like it will take a week to get here, so I’ll keep you posted if it looks like Katia will hit this area. For the past three months, I have worked on-and-off on a third history paper for my Latin American history series, covering the years from 1650 to 1830. Over the weekend, while waiting out Hurricane Irene, I learned about this interesting episode, an unsuccessful Scottish attempt to colonize Panama. It’s too long for a footnote, so I will give it a whole section in the upcoming paper. For my readers, here’s a preview. In the 1690s, Scotland made its only colonial venture in Latin America, and while it did not affect the New World, it changed the course of history for the mother country. Through an act by the Scottish parliament, the Company of Scotland was established in 1695, and it was given extraordinary privileges. For thirty years the Company would have a monopoly on all trade between Scotland and the world beyond Europe; it was authorized to establish colonies where no European colonies existed already; Company ships would not have to pay any customs duties for twenty-one years. The Company’s directors decided to raise a sum of £400,000 for their plans, and by appealing to the patriotism of the Scots, they did it in six months. The money came not only from the rich and famous, but also from very ordinary people in all walks of life; we estimate that nearly 1,500 Scots contributed. In today’s world, £400,000 does not sound like much to a government or major corporation, but it was one fifth of all the money circulating in Scotland at the time. Keep in mind that Scotland was a poor country, the amount raised was 2.5 times the estimated value of Scotland’s annual exports, and the Bank of Scotland (also founded in 1695) was doing its own fundraising at the same time. By the standards of the 1690s, Bernie Madoff would have been a piker, compared with the Company! So what would they do with the money? The first plan was to build outposts in Africa and the Indies, the way other European nations had done, and thereby get a share of the lucrative trade in gold, slaves, ivory and spices. However, one of the Company’s directors, William Paterson, had a different plan. He persuasively argued that if the Company wanted to go to Asia, the best way to do it was to go west, like Columbus did. Of course they would have to cross the Americas at some point, so Paterson told them to build a colony in the Isthmus of Panama, where the overland crossing between the Atlantic and Pacific was only a few dozen miles. According to this reasoning, whoever had a colony in Panama would control the richest east-west trade route in the world. Only the Scots thought this was a good idea. The part of Panama where they planned to build the colony was the Darien Gap, and though it was uninhabited, it was close to two critical Spanish ports, Porto Bello and Cartagena. We saw in the previous chapter that Peru’s silver was sent to Porto Bello before it was shipped to Spain; likewise, Cartagena was the shipping point for the gold and emeralds of Columbia. Whoever built a colony in that neighborhood was sure to make an enemy of Spain, and no other European power wanted to do that, while the succession to the throne of Spain was up in the air. England’s King William III was upset most of all, and he ordered all English colonies in the New World to give no support to the Scots. Scotland went ahead with the “Darien Scheme” anyway. Paterson paid less attention to the reaction of other Europeans, and more attention to the fact that Spain wasn’t as strong as it used to be (remember the buccaneer raids on Panama, just a few years earlier). In 1698 the Company of Scotland sent its first expedition across the Atlantic, bringing 1,200 colonists to a part of eastern Panama they would call “Caledonia Bay.” They built a settlement named New Edinburgh and a fort named Fort St. Andrew. However, the colony only lasted for seven months. They ran out of food quickly, and the Scots hadn’t taken the jungle climate into account; Spain had a warmer climate than Scotland to begin with, so naturally the Spaniards did not suffer as much as the Scots in a place like this. A disease epidemic killed more than 300 colonists, including Paterson’s wife, and their bodies were buried in mass graves. Paterson himself was so sick from the fever that he had to be carried onto the ship, when the decision was made to abandon the colony. After further loss of life, one of their four ships made it back to Scotland. Unfortunately, that ship did not come back with the bad news before the second expedition left, with another thousand colonists (June 1699). It arrived to find a deserted settlement at Caledonia Bay. Despite this, the settlers decided to try their luck. They were encouraged when they defeated the nearest Spanish army unit in early 1700, but that only made the Spaniards angry, and one week later they sent a much larger force. Against this, the Scots were hopelessly outnumbered, and they surrendered after a two-week siege. The Darien Scheme had been a colossal failure. The money spent gained nothing in return, ten of the thirteen ships committed had been lost, and a lot of lives had been wasted; many of the casualties had starved before they could return to Europe, thanks to King William’s decree. Because of the fiasco, and a major fire in Edinburgh in February 1700, the Presbyterian Church suggested that God was mad at Scotland, and called for days of prayer and fasting. Indeed, one of the reasons why Scotland accepted the 1707 Act of Union, which merged England and Scotland to form the United Kingdom, was because the treaty called for compensating the Darien investors with an “equivalent” of nearly £400,000, plus 5 percent interest over a nine year period to cover the rest. Moreover, the Scots realized that their nation could not go it alone, nor could they count on England’s support, though a Scottish king had ruled England as recently as 1688. Henceforth, in this narrative we will not be referring to the citizens of Great Britain as English, Scots or Welsh, but as British, or simply Brits. To this ex-Floridian, Hurricane/Tropical Storm Irene was something of a disappointment. The only hardship I suffered from it was that I couldn’t leave home, and the church service I’ve been attending on Sunday mornings was cancelled. All the utilities stayed on, with the only sign of trouble being that the lights flickered a couple times, when the eye of the storm passed me. Nothing to complain about, really, after the hurricanes I endured in Florida. Anyway, around 10:30 PM last night the rain started getting heavier; I assume that was the third band of the hurricane. Accordingly, I shut the windows completely. That blocked nearly all the sound from outside, too, so I didn’t know what was happening until I woke up this morning. The good news is that Irene was considerably weakened by its passage over North Carolina and Virginia. Thanks to that, it could have been a lot worse than it really was. It seems that we go more rain than wind; the local weather report asserts that this area got 1.5 inches of rain yesterday, and 5.5 inches today. And it’s hard to tell without weather instruments, but I don’t think we got even gale force winds here. The closest the eye of the storm got to us was Carmel, NY, about 14 miles due west of here. That happened around noon. I did not see any clear sky at that point, though, and the winds did not become calm, so it must have been a small eye. After that, Irene seemed to lack a tail; we got some more wind, but no rain. The sun even poked through the clouds at 1 PM. Now as I write this (at 7:30 PM), Irene is over Vermont, so the wind and rain we’re getting now is only remotely related to the storm, though it may be stronger than what we got earlier this afternoon. I have even brought my car out of the landlady’s garage, and reopened a window upstairs so the apartment can have some fresh air. From what I’m hearing on the news, Irene caused 14 deaths in the US. The nearest casualty was in the town of Prospect, when wires fell on an elderly couple’s house and set it on fire; firemen were able to rescue the husband, but the wife died on the way to the hospital. Here in Danbury, I’m hearing the usual reports of downed power lines and trees; hopefully that will be cleaned up before I try going to work in the morning. I’m also hearing about flooding and a loss of electricity in surrounding communities; again, it could have been a lot worse. I guess I’m among the lucky ones this time. For this part of Connecticut, the storm began at 6:30 this evening. That is when the first band of rain from Hurricane Irene reached us, though there’s no wind yet, and it looks like the eye of the storm is over Virginia’s eastern shore. I haven’t closed the last window yet, so outside I can hear it is unusually quiet; hardly any traffic, and no sounds from the park across the street, where on a normal day I hear a soccer game or cheerleaders practicing. All I hear are the raindrops and a few chirps from the nearest trees, which I recognize as the voice of a female cardinal. This morning I went and got the light switch replaced on my car, so now it’s safe to drive at night again. It only took them an hour and a half, which was good because with the on-and-off rain we’ve been having all day, I didn’t want to go anywhere else to wait. On a TV in the shop they showed how New York City is getting ready for the hurricane; at noon, the airports closed and all the mass transit services stopped. The baseball games scheduled for this weekend were cancelled, but the last I heard, a New York Giants vs. Jets game was still going on. If they cancelled it, this will be the first time I can remember that a football game was rained out! The station also showed a pretty lady reporter standing in Lower Manhattan with a pink umbrella. After seeing many Florida reporters out in the middle of hurricanes, dodging flying signs and tree branches, let’s see if Yankee reporters have more sense. After leaving the repair shop, I wanted to try out the Jamaican restaurant that faxes ads to my workplace each week, but they were closed. I should have known that they would not be around, when some real Caribbean weather came this way! I ended up getting a small pizza nearby; that’s something I could not get for most of my time in Kentucky. In the afternoon I got my laundry done, and at 4:30, I returned to the apartment. After bringing the laundry basket, my laptop, etc., inside, I put my car in the landlady’s garage (with trees nearby and a new light switch, I don’t want to take any chances). Now it looks like I’ll be staying put in the apartment for the next 24 hours, at least. Hurricane Irene is currently expected to pass just a few miles to the east of here, with tropical storm strength (58-74 MPH winds), around mid-day tomorrow. It doesn’t look like I’ll be able to attend church, though, with the calls to stay off the streets if it’s not an emergency. 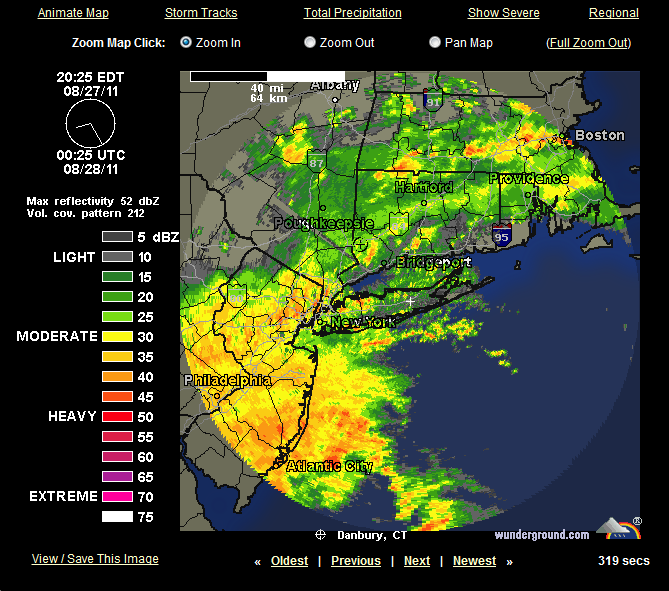 I think the second band of rain from Irene is reaching me now. I’ll see you on the other side. That’s what a local radio station called today in western Connecticut. Of course, since I told you about Hurricane Irene headed this way, the city of Danbury has been getting ready for it to strike, which is expected on Sunday. It looked really bad yesterday when I saw the MSN.com weather map; that showed the exact center of the storm passing three or four blocks west of my apartment! Now the predicted path has veered a little east, so Irene is expected to come ashore at Bridgeport or New Haven, but I’m still close enough that 75 MPH winds are likely. When not at work, I spent yesterday and today stocking up on supplies, just in case. Yesterday I went to Costco; fortunately they didn’t have the same sense of humor as the Orlando Costco. When I was stocking up for a Florida hurricane in 2004, that Costco had the movie “Twister” playing on its TV sets! Today I was in C Town, a local grocery store chain that has good prices on Spanish items; there I got the things on my list that Costco didn’t have. Today at work the company was preparing for the worst, telling everyone how to find out if the office is open on Monday, unplugging all the equipment, and covering it with tarps and garbage bags. Originally I was supposed to work until 6 PM, but we had to get off the computers by 3, so I lost a few hours. Don’t worry, they were overtime hours, so it doesn’t hurt as much as an unpaid holiday (remember the 4th of July). I also learned how to schedule and hold a meeting in the office, something I never expected to be doing previously. For tomorrow, I still have to get my car’s light switch fixed and do the laundry. After that, my main concern will be whether I can go to church on Sunday, because the hurricane is expected to reach us on Sunday morning. See you later! I should have known that The Onion’s reporters would figure it out. I don’t expect to be writing much this week because I am working ten-hour days, and will have my car in the repair shop again on Saturday. Because of security concerns, I can never say much about what I’m doing at work. Meanwhile outside the office, the weather has been delightful. Yesterday morning it was only 50 degrees, and it has been in the 60s and 70s most of the time. I even wore my black fleece pullover to work to keep warm; I can’t remember the last time I wore any sort of jacket in August! The leaves aren’t changing color yet, but the days are definitely getting shorter, too. When I arrived in Connecticut last June, the sky started getting light before 5 AM, and I would always wake up before my clock radio went off. That’s not happening anymore; let’s see how easy it will be to get up if I’m still here when winter arrives. However, there is a bit of that old-time Florida weather headed this way first. Last Sunday Hurricane Irene formed east of Puerto Rico and started heading for the Bahamas and Florida. That gave my family a scare; here’s the page where I described the experience of getting hit by multiple hurricanes, in August-September of 2004. But then on Monday Irene started steering east. My brother takes credit for that; he says hurricanes never strike when he boards up the windows of his place! Nice going; now the hurricane is missing my family members in Florida and Georgia, and going to hit me instead! The latest 5-day forecast has Irene arriving in New England on Sunday night, and while it will be past its peak, it should still pack winds in the 75-100 MPH range (category 1 or 2). I’ll keep readers posted, so long as the electricity doesn’t go out here.